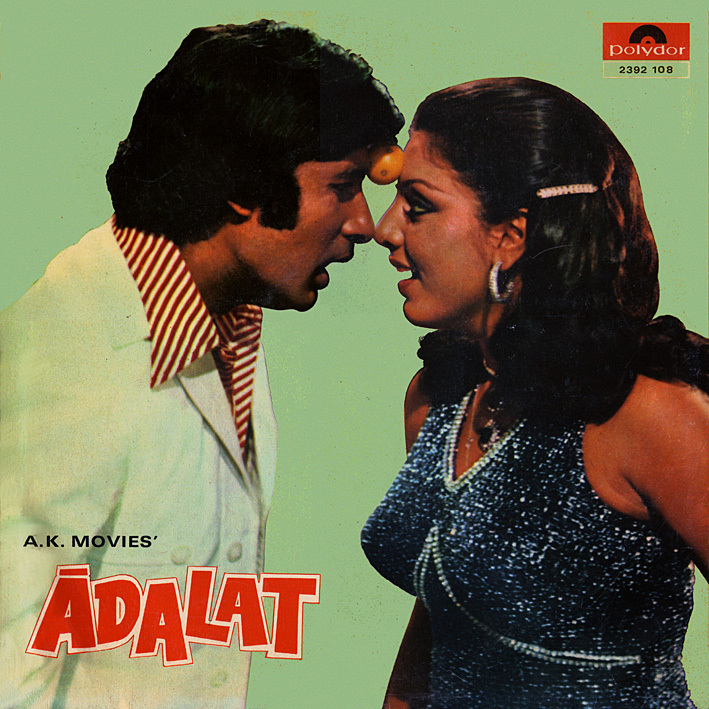 Essentially a dialogue album, the 'Adalat' soundtrack LP is only of interest to me for the ten minutes or so of music at the beginning. Some of it rather good; I wish there was more. 'Tum Se Dur Reh Ke' is the big highlight; a lovely, lively song that reminds me of Usha Khanna's 'Mere Pyase Man Ki Bahar' as well as Lee Hazlewood and Nancy Sinatra's 'Summer Wine'. 'Do Din Ki Jawani Men Bhi Agar' sounds great too, with its funky groove reminiscent of Kalyanji Anandji's own 'Ae Naujawan Hai Sub Kuchh Yahan'. It fades out after only 90 seconds though, unfortunately. I believe a longer version is available on an EP from the film; I should probably try to locate a copy. The album also features a cover version of the Carl Douglas hit 'Kung Fu Fighting'; not credited to anybody but taken "from Polydor LP Soul Factory". The singer appears to be one Carl Duncers (aka King Duncers) whom I'm guessing was a session musician. The song can be heard in the background at one point in the movie (track 8); another scene makes good use of a subsequent Carl Douglas single, 'Dance The Kung Fu' – the original this time, but not on the LP. What's noteworthy about the inclusion of these two songs in a Kalyanji Anandji scored film is of course that they were written by Indian-British pop producer Biddu. Two years later, the three of them would famously co-score 'Qurbani'. 6. A son is born to Dharma, the poor but honest and brave peasant. In need of money, he acts as guide to city-folk Ajit, Sujit and Suresh and saves them from a man-eater. In return, they invite to Bombay, give him a job, involve him in smuggling which lands him in jail. His wife, son and sister suffer misery and are tormented by Ajit and his companions. 7. Released from jail, Dharma takes revenge upon Sujit, Suresh and Ajit, amasses their money, sends his son, Raju, to London for education and safety and takes to a life of crime. 8. Twenty years later, Raju returns from London along with Geeta whom he wants to marry. They have fun together until Raju discovers his father's criminal activities. Disgusted, son confronts father and decides to leave home but mother's explanation arouses pity for the victimised father. Dharma decides to give up life of crime. 9. Dharma's henchmen plot his death, and Dharma is shot and dies in the arms of his son. Thanks PC, it is total recall for me as I listened these dialogues in way back in my childhood, story and dialogues were written by Saleem Javed duo most famous story writer in Hindi Film Industries you should mention their name. Sholay & Deewar etc. also may be included such category. How many times do I actually have to answer that for you to understand?